Looking for a healthy start to your day? Try this recipe for low-fat oatmeal protein pancakes made extra-rich with an unexpected ingredient: low-fat cottage cheese! Pancakes and waffles arent typically considered health foods. They are usually high in simple carbs (especially when you add syrup or powdered sugar), high-in-fat thanks to the oil and butter, and generally low in protein. 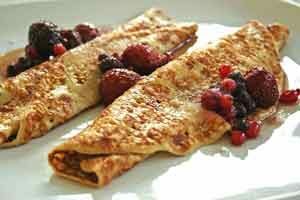 This recipe, courtesy of Liz Fitness, uses low-fat cottage cheese to as a replacement for the usual oil and whole eggs in pancakes; replaces the highly-refined, high-glycemic pancake mix with whole grain oats, and uses fresh berries as a sweet and healthy alternative to the typical puddle of Log Cabin syrup. Even better, the cottage cheese and egg whites in the recipe help boost the protein content of these pancakes, making this a perfect breakfast before heading to the gym. The addition of an artificial sweetener like Splenda is optional. Try pureed fresh stawberries, mashed raspberries and even sliced bananas for a touch of sweetness. Sprinkle a touch of cinnamon or nutmeg on top. Or splurge a little bit with a tablespoon of REAL maple syrup, which only adds an additional 50 calories to the recipe. Instead of butter, try a tablespoon of natural peanut butter which is rich in healthy fats. This tastes particularly well with the maple syrup. Top with frozen, organic strawberries-warmed and sliced and poured over the top with their juices. Or substitute fresh or frozen blueberries, raspberries, blackberries or bananas. You can use Splenda to taste. 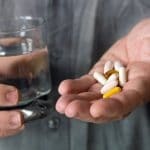 The Portfolio Diet: Lower Cholesterol Without Statin Drugs? 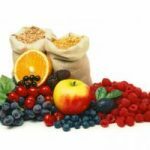 Muesli Recipes: Make Your Own Homemade Muesli!